Adaptix Clinical Solutions is a Clinical Development Organization (CDO) of experienced clinical research employees, consultants, and contractors that provide outsourced services ranging from clinical/regulatory consulting, clinical development planning and statistical analysis, to executing early stage clinical trials, primarily for start-up and smaller Biopharmaceutical and Medical Device companies. 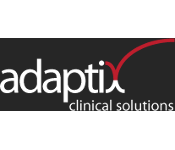 Adaptix is founded by successful clinical research professionals with experience in FDA Clinical Review/Regulation, Pharma/Device Executive Management, and Clinical Site/SMO Trial Execution. Adaptix Clinical Solutions can serve as the virtual equivalent of the traditional in-house clinical department for companies just beginning their clinical programs. In addition, Adaptix also provides specialized clinical consulting services to larger companies needing additional resources and expertise to achieve their deliverables without expanding additional internal resources. Whether you are a small company looking to build your first clinical/regulatory development strategy to help secure the next round of funding, you need someone to help you conduct your First in Man clinical trial, or you are more established and want your legacy studies consolidated into a single database for ISS analysis, Adaptix Clinical Solutions can be the outsource partner to help you! Previous article Alcon Laboratories, Inc.